E-rulemaking, the name given to the recent trend of posting federal regulations online for the statutorily required public “notice and comment period,” represents an attempt by the Federal Government to bring a greater degree of participatory democracy to the very important but often opaque and insular world of Federal Agency rulemaking. In doing so, however, Federal Agencies have been forced to address the policy behind the “notice and comment” period, and how that policy may conflict with democratic ideals. 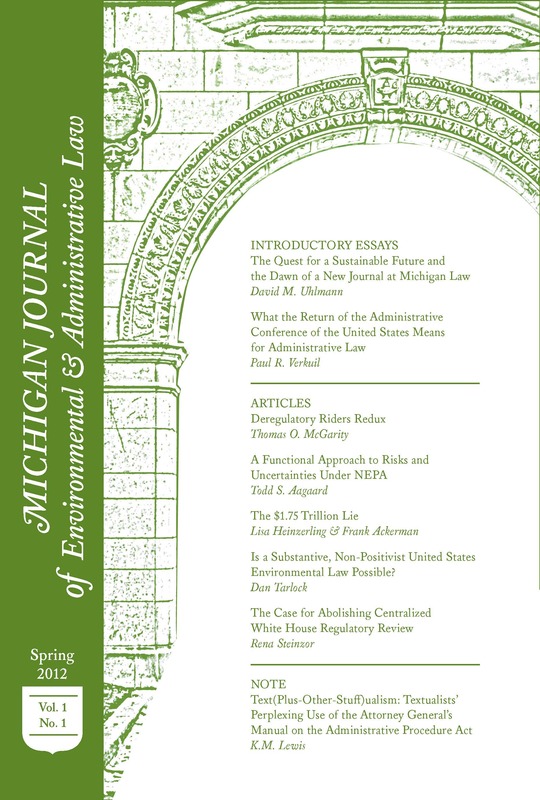 Namely, the “notice and comment” requirement of the Administrative Procedures Act (APA) requires agencies to address and consider comments made by the public on their proposed regulations; however, agencies are not required to give credence to the number of comments that express similar concerns. If agencies were required to consider the number of similar comments left by the public or even incorporate actual to voting into the rulemaking process, it would do much to further the democratic ideals of e-rulemaking. However, agency regulation voting would present serious difficulties that would need to be overcome for it to result in anything other than sham democracy. Section 553 of the APA requires federal administrative agencies to give notice to the public concerning proposed regulations, as well as the “opportunity to participate in the rule making through submission of written data, views, or arguments with or without opportunity for oral presentation.” The agency is then required to address comments left by the public. The process has historically been confined to the dense and intimidating pages of the Federal Register. The purpose or even the existence of the Federal Register is, however, known by only a small minority of citizens affected by agency regulations. On account of the lack of public awareness and involvement in such a crucial realm of modern governance, the Federal Government has recently made a concentrated attempt to attract greater public participation in the rulemaking process. E-rulemaking attempts to supplement the traditional federal register “notice and comment” by posting regulations online (often enhanced with educational materials) and giving the public the opportunity to comment through internet submissions. Thus far, federal agencies have largely focused regulations made available for “notice and comment” through e-rulemaking on less complex and more value-based issues such as the rights of airline passengers and texting while driving for federally regulated commercial truckers. There are two related consequences to limiting e-rulemaking to simple and primarily value-based regulations. The first is that simple regulations are likely to attract simple comments that can easily be dismissed as facile by regulators. Without the force of substantive theoretical or empirical arguments, the force of comments would come not from their content but from the force of numbers behind them. For instance, if one person comments that the tradition of airplane peanuts should not be categorically destroyed for the sake of a small group of people allergic to them who can easily inform the airline of their particular situation on a case by case basis, it is unlikely to sway a regulator who concludes differently, as they have surely already conducted such a simple balancing before writing the regulation. However, if comments expressing the same sentiment occur scores of times, the regulator may be inclined to change his views. Thus arises the second problem that limiting e-rulemaking to simple regulations presents: the comment period, rather than being an opportunity for substantive debate, becomes more akin to voting. At first glance it may seem that the introduction of voting into the rulemaking process would be an innocuous way to bring more democracy to agency regulations. So why not simply allow online voting via e-rulemaking online platforms? It would almost certainly increase public participation, as e-rulemaking observers have often noticed a propensity for participants to “just vote” regarding a proposed regulation rather than make a substantive comment themselves. For simple regulations, where (like peanuts on airplanes) the regulation represents little more than a balancing of individual rights, it seems sensible to give the public a more prominent voice. As the public’s voting choice on simple regulations is unlikely to be founded in any greater knowledge or ignorance than the regulator’s, why should the decision be left to government bureaucrats? The incorporation of a form of voting could even be useful in more complex proposed regulations. Stakeholders sophisticated and organized enough to substantively comment on proposed regulation could present a distillation of their problems with a rule in an effort to both explain and marshal support for their view on the matter. Competition between the government and sophisticated stakeholders may lead to an efficient form of explanation of even complex regulation that would do much to increase the ability for citizens to participate in the rulemaking process. However, proponents of e-rulemaking have expressed concerns about the incorporation of voting into the rulemaking process, often with good reason. The strongest argument against it centers on the fact that the reality remains that participants in e-rulemaking remain a small and unrepresentative sample of those affected by federal regulations at large. As long as this in the case, votes could easily be manipulated by sophisticated and organized stakeholders, who would rejoice at no longer having to rely entirely on substantive arguments to oppose proposed regulations. As the situation currently stands, this argument have much force, and it is difficult to assert that for most regulations incorporating voting would result in anything other than a travesty of democracy. Nonetheless, it may be in the interest of democracy to allow voting on particularly impactful regulations if there is a first a substantial notice campaign to attract a representative sample to the e-voting forum. The federal government may not be interested in such measures as they would likely be both costly and time consuming, but if it is serious about bringing greater democratic participation to the rulemaking process it may deem the costs worth the benefit. Jack Carver is a Contributing Editor for MJEAL. He can be reached at jjcar@umich.edu.